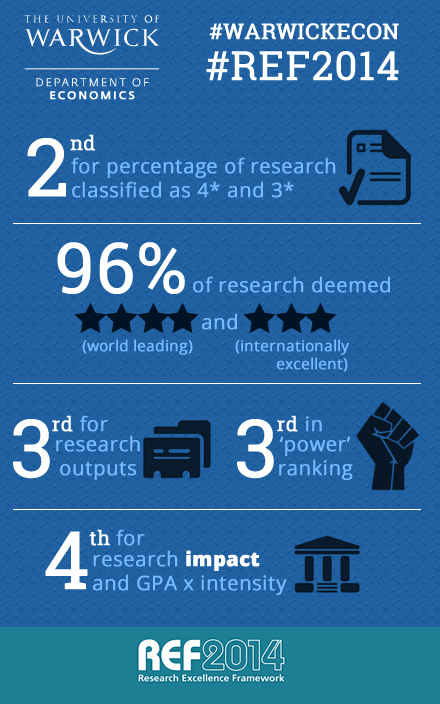 The results of the highly anticipated 2014 Research Excellence Framework (REF) were announced in December2014. The Department of Economics at The University of Warwick is ranked 4th, affirming the high calibre of research in the Department. (Note: The LSE, UCL, Oxford and Warwick remain in the Top 5 in both of the shown rankings). We are really pleased with the results of the REF which cement our position as one of the leading departments in the UK for research excellence. High-calibre research is central to all we do at Warwick and I congratulate every member of staff in the department who has directly or indirectly contributed to this success. The rankings underscore the rapid ascent of the Department of Economics into the top tier of the discipline’s research engines in the nation. In our scant 49-year history, the Department has built an outstanding research performance on the sheer quality of its faculty members and their scholarship which is clearly evidenced by our exceptional achievement. The REF results swiftly follow our number one ranking in The Times and Sunday Times’ league tables for 2015 confirming our position as the top Economics Department in the UK.